CAD is under pressure due to the different price ranges of Oil which is not align with Fed and the Bank of Canada policies. The pair is finding support at 1.31090 with resistance at 1.31480 which both lines are above the weekly pivot point at 1.30740. 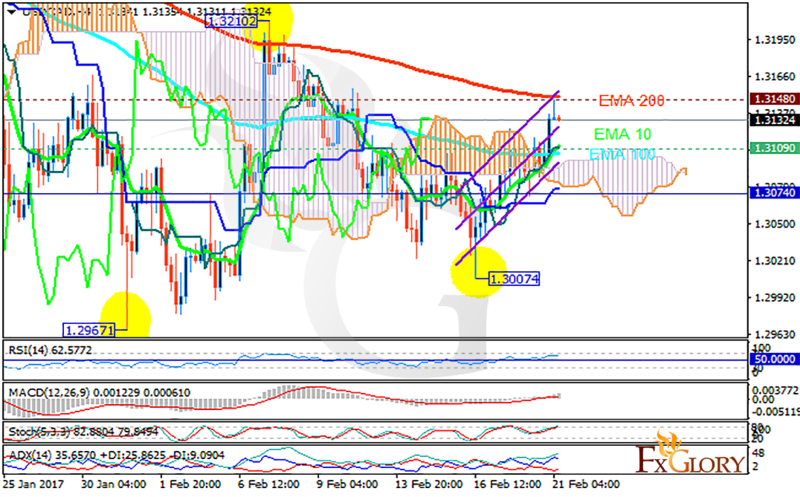 The EMA of 10 is moving with bullish bias along the ascendant channel and it has already passed the EMA of 100; they are both below the EMA of 200. The RSI is moving in overbought area, the MACD indicator is in positive territory and the Stochastic is showing upward momentum. The ADX is showing strong buy signals. The price is above the Ichimoku Cloud and the Chinkou Span. The Tenkan-sen is showing an upward trend while the Kijun-sen is showing a horizontal trend. The support level breakthrough will smooth the way for further decline targeting 1.3000.